The IAYC is an experience unlike any other; a place for unforgettable memories and lifelong friendships. Young and enthusiastic students come together from all corners of the world, aged between 16 and 24. The camp hosts around 65 participants for three weeks in a remote location, with access to some of the most spectacular skies you may have ever seen. The amount of knowledge to be gained from the IAYC is limitless. You can learn to use telescopes, create incredible astro-photographs, and most of all work on a project of your own, guided by a leader who will help you to make some amazing discoveries. 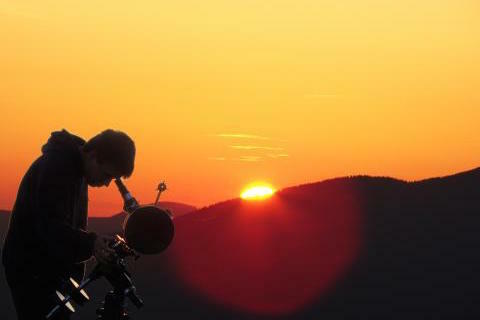 No previous astrophysical knowledge is required; all that is needed is a passion for astronomy and the night skies! IAYC 2016 participants in Avebury stone circle (UK) on excursion day. You can find more information about what the camp is like here. Please check out the first info about next years camp. Details of the IAYC 2019, check out this year’s working groups and apply online! Next year the IAYC will take place between the 21st July to the 10th August, 2019 in Klingethal! Details of the IAYC 2018, check out this year’s working groups and apply!